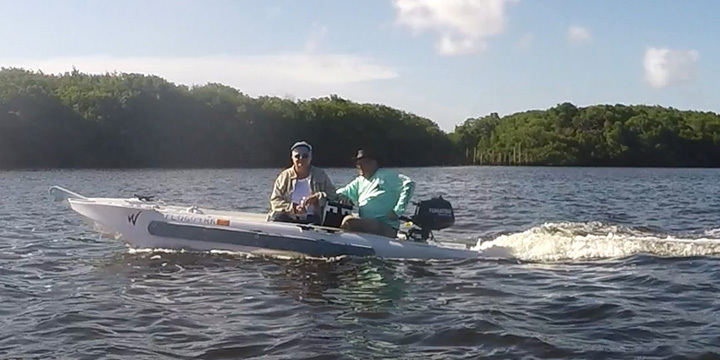 People who watch videos showing the Wavewalk S4 micro skiff in action have no problem realizing that it raises the bar in performance terms, beyond anything that small skiffs, Jon boats and fishing kayaks can. However, some people find it harder to understand how the S4 is built, and this is not surprising, since the S4 is unique, and revolutionary. Recently, Wavewalk released this new technical figure (see above) that describes the S4 visually, in detail. In itself, this figure isn’t enough to provide a full understanding of all the aspects of the S4’s technical innovations, unique features, and high performance in multiple applications, but it can serve as an additional means to get a better insight. Note the slanted sides of the cockpit that enhance performance in kayaking and canoeing, and the front deck that can serve as a stand up casting platform, which is a feature typical to microskiffs. Also, it’s worth noting the integrated (molded-in) pairs of carry handles (total of 4) at the bow and stern, which make it so easy to carry this ultralight microskiff, as well as attach it to a vehicle or a dock, or to another boat. A skiff is a small boat that can take you and your fishing buddy or another person on board, and lets you fish comfortably in shallow water and flat water, as well as drive in moderately choppy water. The capacity to take two full size passengers on board is a minimum requirement, and a watercraft that fails to cross this threshold is not a skiff. Such a sub-skiff may be a tiny Jon boat or dinghy, a motorized kayak, or a motorized paddle board, but it’s not a skiff. In fact, it’s not even a micro skiff, namely a small skiff, dubbed “microskiff”. 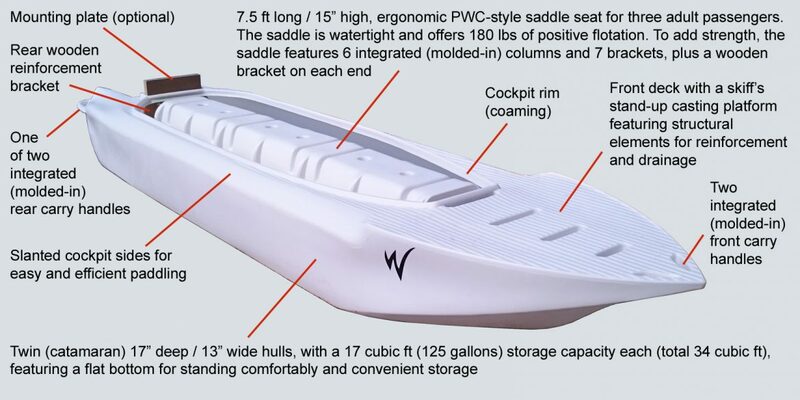 Whether a skiff features one type of hull or another is practically irrelevant, since skiffs come with some variations on their hull shapes, as do Jon boats and many other types of boats. A portable skiff should be a car-top boat, and one that a single person could upload to the roof rack of their vehicle without an effort. A skiff that’s too heavy to allow you to go fishing on your own if you want to or have to, is not portable. Note how relaxed and comfortable the crew looks, and the fact that the front passenger sits while facing sideways, that is with both legs in one on the hulls. If this passenger felt unstable to any degree, she would have ridden the saddle-seat facing forward, with a leg in each of the hulls, similarly to the way the passengers of a personal watercraft (“jet-ski”) sit, since this posture provides the highest degree of balancing capability. Stability in small boats is the result of the boat’s own design, namely the way its buoyancy is distributed in the hull, and the way the passengers are seated in it. The above video shows the S4 to be a skiff that’s stable enough even if one of its passengers chooses not to take advantage of the balancing capability that this boat offers, and they rely solely on the static stability provided by the hulls. The video also shows that even with a crew that weighs over 400 lbs and a 40 lbs outboard motor, the S4 skiff could very well carry a third passenger on board – In terms of space, the front half of the cockpit is empty, and so is the front deck that can serve as a casting platform, and in terms of carrying capacity, as can be seen from the high free board at the front of the boat, and the passengers’ obvious well being, which comes from their being stable and comfortable. Ultralight Micro Skiffs and Portable Boats that work great as paddle craft – Solo and tandem fishing kayak, or canoe. The W700 weighs just 80 lbs without motor and accessories, and it’s easy to car top, even for one person. This ultralight, stable skiff can carry up to 580 lbs on board, which means two large size anglers and their fishing gear. Paddling it is a pleasure, solo or tandem, with kayak or canoe paddles. Super stable, super mobile, comfortable and dry. Lightweight, portable, car top boat. Launch, go, fish and beach where no one else can. No more trailer, and no more boat ramps. Drive, fish, paddle and pole standing up in full confidence. Features a long, comfortable jet-ski style saddle. Plenty of legroom and storage space. from Wavewalk kayaks boat, either motorized with an outboard gas engine (I.E. as a personal microskiff) or outfitted with an electric trolling motor and non-motorized, that is as a kayak. Wavewalk’s main website features hundreds of customer reviews that you may be interested to read. All these reviews include the client’s full name and state, and nearly all of them include pictures as well. Read more about what Wavewalk micro skiffs can offer in terms of fishing in Texas, namely fishing the flats and the gulf, as well as freshwater fishing.